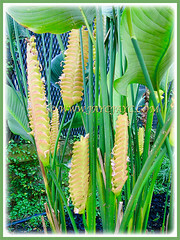 Yellow Rattleshaker is an exotic tropical plant with fascinating yellow inflorescences. 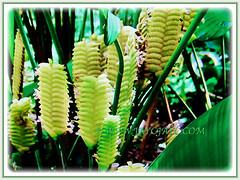 It will surely be a welcome addition to your garden if you desire a tropical theme. A free flowering herbaceous plant that will add beauty and interest, as well as a conversation piece for visitors and people passing by. 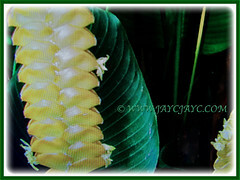 Botanical Name: Calathea crotalifera (syn. : Phyllodes/Calathea insignis, Calathea quadralispica). 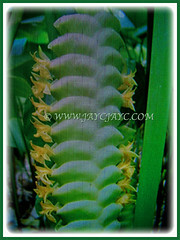 Common Name: Rattlesnake Plant, Rattle Shaker, Rattlesnake Ginger, Yellow Rattleshaker, Yellow Rattle. Etymology: The genus name, Calathea comes from the Greek word, kalathos, meaning a basket, in reference to the inflorescences borne by some species. The species epithet, crotalifera is the combination of the Latin substantive crotalum, meaning rattlesnake and of the verbum fero, meaning to carry, with reference to the shape of the inflorescence. Origin: Native to Mexico, Central and South America. However, it is cultivated worldwide. Plant type: An ornamental, perennial evergreen, and rhizomatous herbaceous plant. 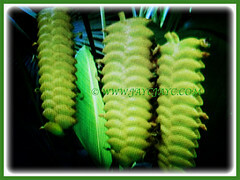 Features: Calathea crotalifera is a species of the genus Calathea that comprises of about several dozen species. A rhizomatous herbaceous perennial that grows up to 3 m in height, forming dense tufts. The glossy leaves are coloured deep green above and pale green below. The leaves, carried on a 0.6 to 1 long petiole are alternate and basal, measuring 0.4 to 1 m long and 15-50 cm broad. it has the characteristic feature of folding up their leaves at dusk to dawn, resembling hands put together in prayer. In the morning the leaves will return to normal position, almost perpendicular to the petioles. 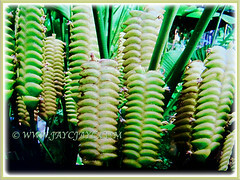 It produces unique inflorescences on a 20-30 cm long peduncle, emerging from the foliar sheath, upright, 15-25 cm long and 5-7 cm broad. They consist of stacked leathery floral bracts with small, yellow or yellow-orange flowers peeking out at the edges. The relatively inconspicuous actual flowers are tubular and have 3 unequal lobes. 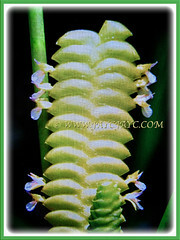 The inflorescence resembles a great deal like a rattlesnake’s rattle. The flowers are followed egg-shaped seed capsules about 1.3 cm long, containing dark blue seeds surrounded with white flesh. 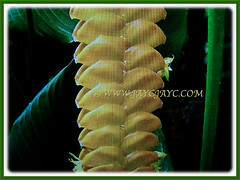 Culture (Care): Calathea crotalifera or Yellow Rattleshaker is quite easy-growing and needs minimum care. Light: Grows best in filtered sunlight or semi-shade. Do not keep them is direct sunlight. Moisture: Moderate water requirement. Water regularly but do not keep it waterlogged. Soil: Humus enriched and well-drained loamy soils. Others: To keep plant tidy, cut off brown and withered leaves and spent flower spikes. It benefits greatly in a high humidity environment. Improve the humidity levels with a humidifier. Feed once monthly with a slow release balanced fertilizer for flowering plants. Generally free from serious garden pests. Since Calathea crotalifera is not frost tolerant, advisable to grow it indoors as a houseplant or in a green house with sufficient bright light and accepted temperatures. 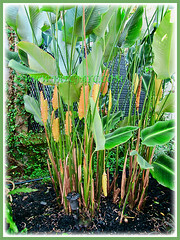 It is a tropical plant but can be overwintered indoors in colder regions. Regular waterings in summer but do not keep plant waterlogged, and less during the colder seasons. Shelter your plants from strong winds and mild cold. Feed lightly once a month with a slow release balanced fertilizer for flowering plants in spring and throughout the summer growing period. Use a humidifier if necessary to increase humidity levels to prevent dry air. They flower from spring to summer and almost year round in warmer climes. Propagation: Easily propagated by dividing the clumps. 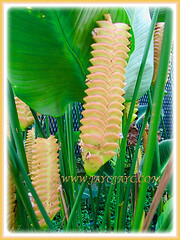 Usage: Calathea crotalifera or Yellow Rattleshaker is excellent as a landscape plant. When grown on the ground, it will throw out more yellow spikes to reward you. Ideal in garden beds and borders. Can be planted in large tubs or containers as a lovely specimen. The inflorescences are long lasting and will be great when used in floral arrangements.